Audiobooks have evolved over the past few years in a number of ways. CD’s are now the norm, cassettes used to be. Many more titles are being made into audiobooks. But still, even though audiobooks are a distinct medium, they still haven’t taken the inevitable step away from print. This audiobook, which is quite excellent, is a good example of what I mean. Though this is a collection of short stories, nowhere, on the inside or outside of the packaging, does it list the Table of Contents. This kind of thing has audiobook listeners looking for the print version of the book for this information. It’s as if audiobooks are being made as an augmentation of their print counterparts. Surely, they should be created stand-alone. Information, like the Table of Contents of a short story collection, should not only be included, but it should be visible before purchase. Still, like I said, this audiobook is excellent. 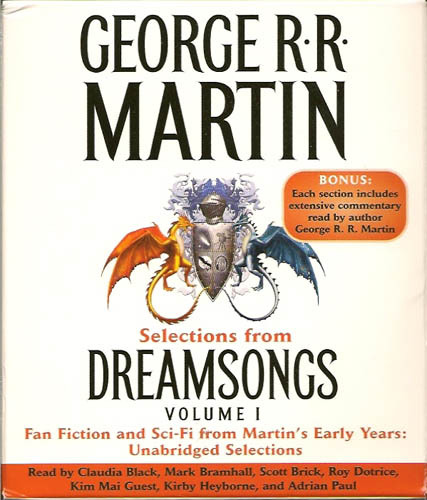 It’s the first of three collections that contain selections from the three Dreamsongs books that collect George R.R. Martin’s short fiction. This Volume covers the early years of Martin’s career, from his fan fiction publications through his first sales to his first awards. As interesting as the included stories are the biographical introductions to each section that are read by George R.R. Martin himself. These introductions are lengthy, though I would have enjoyed even more of them. He talks about his first writings, his first sale, his first nominations, and his first Hugo, for “A Song of Lya”. It’s a candid overview of a writer’s life, and I enjoyed it every bit as much as I enjoyed similar details in Stephen King’s On Writing. This section contains stories that Martin wrote for fanzines. If you want to read a villain’s monologue as written by George R.R. Martin, look no further than “Only Kids Are Afraid of the Dark”, which is a “hero meets demon prince” story. Adrian Paul gives the story an uplifting dramatic reading. Roy Dotrice should read all of George R.R. Martin’s fiction. He’s just got this gravel quality that seems to match so many of Martin’s heroes. In “The Hero”, Martin’s first story sale, which Dotrice reads, a future soldier who has finished his tour of duty decides not to re-enlist, and to request passage to Earth, as was promised when he signed on. Dotrice manages to make the soldier even more believable. And here we see Martin at near full-strength. “A Song for Lya”, read by Mark Bramhall, is the centerpiece of this volume as far as I’m concerned. It won Martin his first Hugo, and is a moving story about a couple who arrives at a planet to investigate the influence of the indigenous alien religion on humans. “The Way of Cross and Dragon” again deals with religion, but this time in a form that closely resembles the Catholic Church. Audible.com has all three volumes of Dreamsongs available now. Not only can you buy each volume, but they’ve also allowed you to purchase the individual sections of the books, each introduced by the author. Wonderful stuff! I do not particularly like Mr. Martin’s writings [I have another of his books]but I purchased Dreamsongs volume one because Adrian Paul was doing two of the stories. If Adrian Paul did more audio book readings, I would purchase more of them. I enjoy listening to him. Roy Dotrice is good at reading stories also, I remember him as “Father” in “Beauty and the Beast”. But if I had to choose, it would be Adrian. I became a fan of Martin after reading “A Game of Thrones”. I hadn’t read much of his fiction before that one. 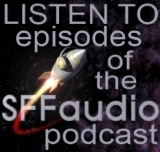 When it came out on audio, I listened to it, too – Roy Dotrice reads it. Has Adrian Paul read anything else? He’s excellent. Thanks so much for listing the contents. I was fairly confused about how complete the Dreamsongs audiobooks are (Amazon has them listed as abridged). It seems that the single volume print edition (UK only? ), the two volume print edition, and the three volume audio edition all contain the same contents in the same order, just split up in different ways. If anyone knows better please let me know. The fact that neither the packaging, nor the audible.com listing contain the contents make it difficult to make an informed purchase. The fact that V1 in print and V1 in audio do not cover the same ground just adds to that.